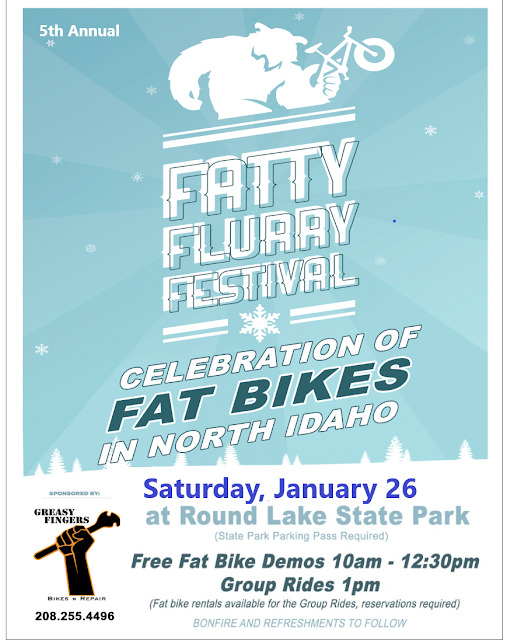 Fatty Flurry Fest is a celebration of Fat Bikes in North Idaho. If you have never tried a fat bike before, and wanted to try before you buy, here is your chance...for free. And if you already have a fatty, come hang with some fellow fat bikers and ride some cool trails. Post ride will feature some socializing and some sled pulling with some refreshments around the fire. Some Notes: You will need a State Park Pass which can purchases on site for $5 or you can get an annual pass for your vehicle at the DMV beforehand. If you don't have a bike with tires at least 3.8" wide, leave it at home. There are porta potties that are nice and clean, but no running water. We will have a fire to keep you warm. All activities will be at the lake parking lot/event pavilion. Camping (if you are brave enough) is available, as well as ice fishing, snowshoeing, xc skiing, ice skating, sledding...you name it. This is a "low pressure" social Fat Bike event.